GEORGE WASHINGTON. 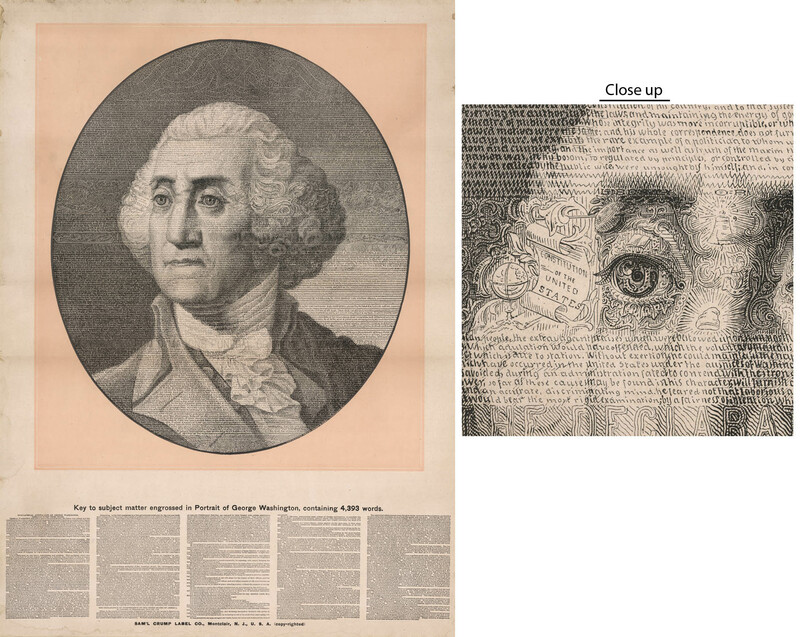 KEY TO SUBJECT MATTER ENGROSSED IN PORTRAIT OF GEORGE WASHINGTON, CONTAINING 4,393 WORDS. Two color stone engraving, 1889. Image 18 7/8 x 16 3/8" (47.7 x 41.8 cm) plus lower text and margins. Publisher : Published by Sam'l Crump Label Co. Montclair, N.J., U.S.A.	Below image Copyright 1889 by Crump & Coby, Montclair, N.J. The image of Washington is made up or 4,393 word's and symbols including a Masonic symbol, the Liberty Bell and Liberty Cap. It begins with biographical annotations of Washington, the Declaration of Independence, and an extract from Dr. Mason's Funeral Oration. The Crump Label Company was founded in 1832 by Samuel Crump, Sr., a wood engraver and printer in Montclair, NJ. Crump senior retired in 1861. From 1875 to 1878, the firm was Crump & Everdell, Than at some point Crump & Coby, subsequently the Crump Label Press. In 1891, Crump Label , Russell Morgan and other label manufacturers came together under the umbrella of the United States Printing and Lithographing Company..